For an island of only about 14,000 people Kodiak Alaska uses a lot of electricity. So it’s impressive that 99.7% its annual electricity needs are met by pollution free sources. And when the Kodiak Electric Association (KEA) switched to full renewables use, it eliminated $7 million a year in fuel costs for diesel powered generators. KEA is now able to deliver power at a price that is lower than it was in 2001. What may be even more noteworthy, is that Kodiak is not connected to a regional power grid, unlike most areas with high renewable-power utilization such as Germany and Denmark. Grid connection would enable KEA to trade electricity back and forth with other electric utilities as its supply and demand vary. Variability in electricity generation due to weather fluctuations is a challenge that renewable-power opponents frequently cite when they argue against adoption of wind and solar power. Approximately 20% of KEA’s power is wind generated, with almost all of the balance supplied by hydropower. Diesel generators are turned on only as needed for system maintenance. Since KEA is not grid-connected, it has to deal with supply and demand mismatches in other ways. To accomplish that, it has a 3 MW battery back-up system. Additionally it plans to install two 1MW load-balancing flywheels, which will also help extend the life of the battery system. Kodiak is a seafood processing center and it’s cold and dark outside in the winter. On December 21 the sun doesn’t rise until 9:52 am and it sets at 4:23 pm. The average per capita electricity use in Alaska in 2010 was 7,952 kWh. Kodiak’s per capita use for 2015 is projected to be 11,600 kWh (based on KEA generation data through the end of June 2015). KEA residential customers pay 13.8 cents per kWh, lower than much of the rest of Alaska and just above the national average rate of about 12.5. 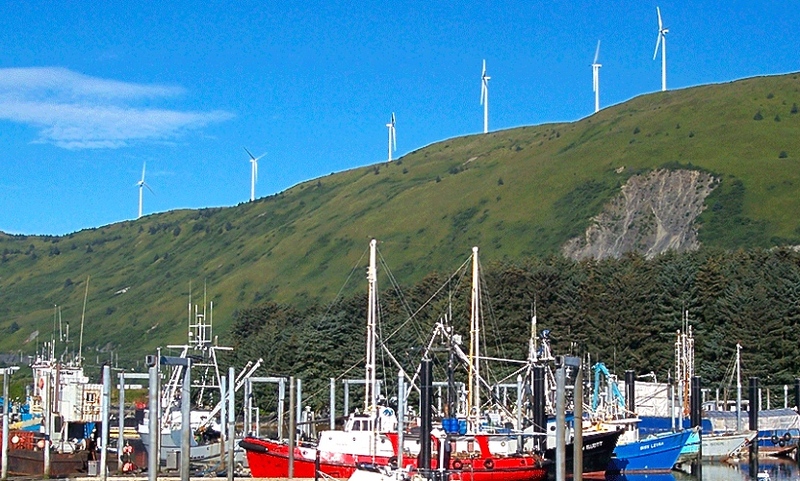 To learn more about Kodiak’s renewable energy success you can read articles published by the Islanded Grid Resource Center, the Rocky Mountain Institute, and Aljazeera. Thanks to Alexa Leinaweaver for suggesting the story.